Feng Bao, Moti Yung, Dongdai Lin, and Jiwu Jing, "Information Security and Cryptology"
This book constitutes the thoroughly refereed post-conference proceedings of the 4th International Conference on Information Security and Cryptology, Inscrypt 2009, held in Beijing, China, in December 2009. The 22 revised full papers and 10 short papers presented were carefully reviewed and selected from 147 submissions. 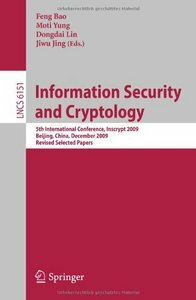 The papers are organized in topical sections on cryptanalysis; signature and signcryption; key exchange; private computations; cipher design and analysis; public key cryptography; network and system security; hardware security; and web security.